iPhone X's Face ID Inspires Privacy Worries — But Convenience May Trump Them : All Tech Considered Advocates are concerned facial scan data could be stolen, or that a successful rollout could make consumers more comfortable with less innocuous, less accurate uses of facial recognition technology. Phil Schiller, Apple's senior vice president of worldwide marketing, announces features of the new iPhone X on Sept. 12 at the Steve Jobs Theater on the new Apple campus in Cupertino, Calif. The phone's new ability to unlock itself using a scan of its owner's face inspired a strong, divided reaction. A feature of Apple's new high end iPhone X called Face ID — the phone will unlock when you look at it, or rather when it looks at you — has got privacy advocates nervous. The new feature set off a fairly silly joke meme on Twitter with jibes such as "Face ID is the worst thing to happen to Beverly Hills plastic surgeons." But critics are taking the feature seriously, in part because Apple is likely to make Face ID very appealing and simple to use. That wasn't clear when it showed off Face ID last week at a press event, when Apple Senior Vice President Craig Federighi went to open his phone by looking at it and it didn't work. Apple says the fail had to do with stagehands moving the phone around before the demo. The company says it has built the most secure and easy-to-use facial recognition technology on the market, and Fatemeh Khatibloo — an analyst with Forrester — believes it. "What we know about Apple is that they tend to get this stuff right," she says, adding that the reason features like Face ID haven't been adopted widely so far is because other companies haven't done a good job. "Android has had face recognition unlock for a while now," she says. "It just hasn't been a very good or consistent experience." For example, critics of Samsung's new Galaxy Note 8 say it is easily fooled with a photo of the owner. Apple's iPhone X won't be available until early October, but the company says that trick won't work on Face ID because the phone uses 3-D scanners. Still, privacy are advocates worried. Sen. Al Franken, D-Minn., wrote a letter to Apple CEO Tim Cook, voicing concerns such as whether the face recognition data could be taken out of the phone and used for other purposes. Apple says that won't be possible because the data will be stored locally in the phone — so even Apple can't get it. Still, that doesn't entirely reassure privacy advocates like Clare Garvie, with the Center on Privacy and Technology at Georgetown Law. 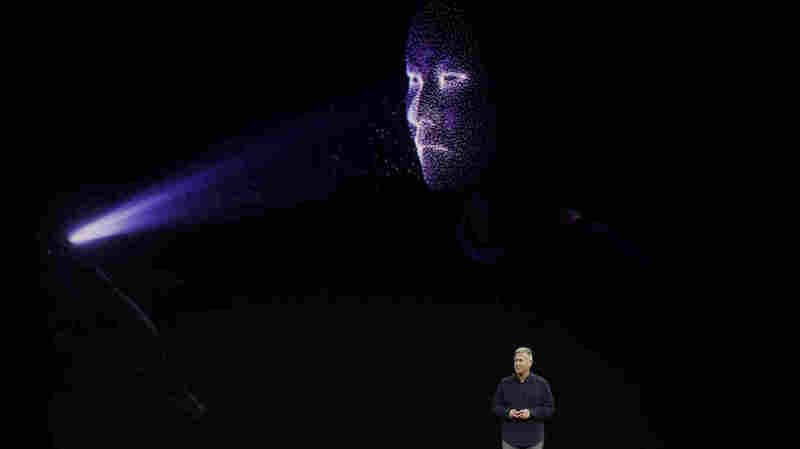 She worries that if Apple's Face ID does work well, people will be more accepting of other uses for the technology, "forgetting that other uses of face recognition may be less accurate, may be more privacy invasive, may make mistakes." For example, Garvey says that many retailers quietly have been rolling out face recognition technology to identify shoplifters — but that it's not error-free. "Imagine you look very similar to somebody who is enrolled in a known shoplifter database, and the machine thinks you're that person," she says. "So every time you walk into one of those retail stores you might get hustled out." A lot of customers were hustling in to Apple's store in downtown San Francisco this weekend. I asked a few shoppers their opinions of Face ID, and most felt like Jess Bendit. "Is it going to take off because it's convenient? Probably," Bendit said. "Hey, we're all narcissists, often. So the idea that my phone could recognize me personally, it's super-flattering, I guess." And Apple has been marketing itself for some time as the company that values user privacy — a message that has gotten through to Nick Reynolds and other fans. "I think it's cool that they're pushing the boundaries of the technology again — and given it's Apple, they're going to do it in a way that respects privacy compared to like anybody else who might do it," he said. "So that's cool." At least at this store, there was a sense that resistance is futile. Face ID is the future — and if it's convenient and fast, that will trump privacy.